Definition at line 3063 of file Decl.h. Definition at line 3135 of file Decl.h. Definition at line 3134 of file Decl.h. Definition at line 3100 of file Decl.h. Definition at line 3070 of file Decl.h. Definition at line 3863 of file Decl.cpp. 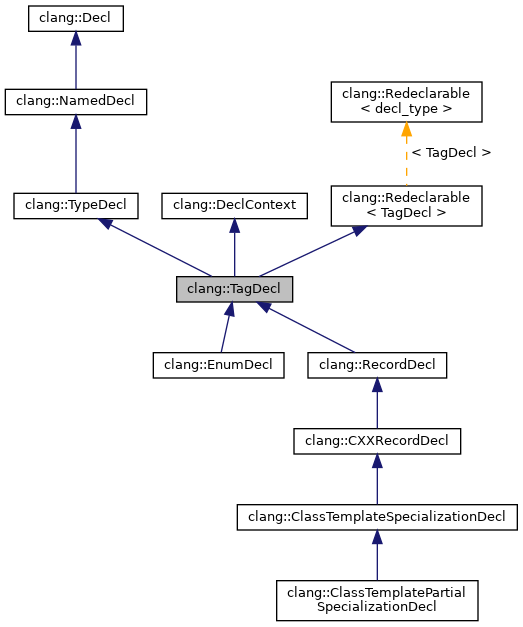 References Enum, setBeingDefined(), setCompleteDefinition(), setCompleteDefinitionRequired(), setEmbeddedInDeclarator(), setFreeStanding(), clang::Redeclarable< TagDecl >::setPreviousDecl(), setTagKind(), and clang::TTK_Enum. Definition at line 3317 of file Decl.h. Definition at line 3313 of file Decl.h. Definition at line 3310 of file Decl.h. Definition at line 3311 of file Decl.h. Completes the definition of this tag declaration. This is a helper function for derived classes. Definition at line 3911 of file Decl.cpp. References clang::Decl::getASTMutationListener(), hasDefinition(), setBeingDefined(), and setCompleteDefinition(). Referenced by clang::EnumDecl::completeDefinition(), and clang::RecordDecl::completeDefinition(). Definition at line 3144 of file Decl.h. Referenced by clang::ClassTemplateSpecializationDecl::getSourceRange(), clang::TemplateDeclInstantiator::InstantiateEnumDefinition(), rewriteToNSMacroDecl(), and clang::ASTDeclWriter::VisitTagDecl(). Reimplemented in clang::EnumDecl, and clang::CXXRecordDecl. Definition at line 3889 of file Decl.cpp. Referenced by clang::CXXRecordDecl::getCanonicalDecl(), clang::EnumDecl::getCanonicalDecl(), HandleConstructorCall(), and clang::ASTTypeWriter::VisitTagType(). Definition at line 3157 of file Decl.h. Returns the TagDecl that actually defines this struct/union/class/enum. When determining whether or not a struct/union/class/enum has a definition, one should use this method as opposed to 'isDefinition'. 'isDefinition' indicates whether or not a specific TagDecl is defining declaration, not whether or not the struct/union/class/enum type is defined. This method returns NULL if there is no TagDecl that defines the struct/union/class/enum. Definition at line 3923 of file Decl.cpp. References clang::NamedDecl::getIdentifier(), isCompleteDefinition(), mayHaveOutOfDateDef(), clang::Redeclarable< TagDecl >::redecls(), and clang::Decl::updateOutOfDate(). Referenced by clang::EnumDecl::getDefinition(), clang::RecordDecl::getDefinition(), clang::serialization::getDefinitiveDeclContext(), clang::DeclContext::getPrimaryContext(), and clang::Sema::isAcceptableTagRedeclaration(). Return SourceLocation representing start of source range ignoring outer template declarations. Definition at line 3149 of file Decl.h. Definition at line 3238 of file Decl.h. Referenced by clang::Sema::ActOnClassTemplateSpecialization(), clang::Sema::ActOnExplicitInstantiation(), clang::CodeGen::CodeGenTypes::addRecordTypeName(), clang::Sema::CheckFriendTypeDecl(), clang::ast_matchers::internal::getNodeName(), clang::getParameterABISpelling(), and clang::TextNodeDumper::VisitRecordDecl(). Implementation of getMostRecentDecl(), to be overridden by any subclass that has a redeclaration chain. Definition at line 3110 of file Decl.h. Returns the next redeclaration or itself if this is the only decl. Decl subclasses that can be redeclared should override this method so that Decl::redecl_iterator can iterate over them. Definition at line 3102 of file Decl.h. Definition at line 3297 of file Decl.h. Return SourceLocation representing start of source range taking into account any outer template declarations. Definition at line 3879 of file Decl.cpp. Implementation of getPreviousDecl(), to be overridden by any subclass that has a redeclaration chain. Definition at line 3106 of file Decl.h. Retrieve the nested-name-specifier that qualifies the name of this declaration, if it was present in the source. Definition at line 3282 of file Decl.h. Retrieve the nested-name-specifier (with source-location information) that qualifies the name of this declaration, if it was present in the source. Definition at line 3290 of file Decl.h. Referenced by clang::if(), clang::index::IndexingContext::indexTagDecl(), clang::TemplateDeclInstantiator::InstantiateEnumDefinition(), and clang::ASTNodeImporter::VisitClassTemplateSpecializationDecl(). Definition at line 3883 of file Decl.cpp. References clang::SourceRange::getEnd(), clang::Decl::getLocation(), getOuterLocStart(), and clang::SourceLocation::isValid(). Definition at line 3242 of file Decl.h. Referenced by clang::Sema::ActOnClassTemplateSpecialization(), clang::Sema::ActOnExplicitInstantiation(), clang::Sema::CheckCompletedCXXClass(), clang::Sema::CheckConstexprFunctionDecl(), clang::Sema::CheckFriendTypeDecl(), classifyPointerDeclarator(), getPaddingDiagFromTagKind(), clang::TemplateDeclInstantiator::InstantiateClassTemplatePartialSpecialization(), clang::TemplateDeclInstantiator::InstantiateEnumDefinition(), clang::Sema::isAcceptableTagRedeclaration(), isCFStringType(), clang::CXXRecordDecl::isCLike(), clang::CXXRecordDecl::lambdaIsDefaultConstructibleAndAssignable(), clang::ASTNodeImporter::VisitClassTemplateSpecializationDecl(), and clang::ASTDeclWriter::VisitTagDecl(). Definition at line 3301 of file Decl.h. Definition at line 3273 of file Decl.h. Referenced by clang::CodeGen::CodeGenTypes::addRecordTypeName(), checkEnumComparison(), clang::TypedefNameDecl::getAnonDeclWithTypedefName(), clang::getParameterABISpelling(), clang::TemplateDeclInstantiator::InstantiateTypedefNameDecl(), isTemplate(), setTypedefNameForAnonDecl(), clang::ASTDeclWriter::VisitEnumDecl(), clang::ASTDeclWriter::VisitRecordDecl(), and clang::ASTDeclWriter::VisitTagDecl(). Is this tag type named, either directly or via being defined in a typedef of this type? it is a class or enumeration type that is named (or has a name for linkage purposes) and the name has linkage; ... C++11 [dcl.typedef]p9: If the typedef declaration defines an unnamed class (or enum), the first typedef-name declared by the declaration to be that class type (or enum type) is used to denote the class type (or enum type) for linkage purposes only. C does not have an analogous rule, but the same concept is nonetheless useful in some places. Definition at line 3269 of file Decl.h. Referenced by computeCachedProperties(), findCommonEnumForBlockReturns(), clang::TemplateDeclInstantiator::InstantiateTypedefNameDecl(), and clang::Sema::setTagNameForLinkagePurposes(). Return true if this decl is currently being defined. Definition at line 3188 of file Decl.h. Referenced by CanDeclareSpecialMemberFunction(), clang::DeclContext::getPrimaryContext(), clang::ASTNodeImporter::ImportDefinition(), clang::TagType::isBeingDefined(), clang::Sema::IsDerivedFrom(), clang::Sema::isThisOutsideMemberFunctionBody(), clang::CXXRecordDecl::lambdaIsDefaultConstructibleAndAssignable(), clang::Sema::RequireCompleteDeclContext(), and clang::ASTNodeImporter::VisitLambdaExpr(). Definition at line 3250 of file Decl.h. Referenced by getAccessFlag(), getTagForRecord(), clang::Type::isStructureOrClassType(), and isValidBaseType(). Definition at line 3168 of file Decl.h. Referenced by CheckASTMemory(), clang::EnumDecl::completeDefinition(), clang::RecordDecl::completeDefinition(), clang::CodeGen::CGDebugInfo::completeRequiredType(), clang::CodeGen::CGDebugInfo::completeUnusedClass(), clang::CodeGen::CodeGenTypes::ConvertRecordDeclType(), clang::CodeGen::CodeGenTypes::ConvertType(), DiagnoseReinterpretUpDownCast(), clang::CodeGen::CodeGenFunction::EmitVTablePtrCheckForCast(), clang::ASTContext::getASTRecordLayout(), clang::CodeGen::CodeGenModule::getClassPointerAlignment(), GetDeclSpecTypeForDeclarator(), getDefinition(), clang::CodeGen::CodeGenModule::getDynamicOffsetAlignment(), clang::CodeGen::CodeGenModule::getVBaseAlignment(), clang::if(), clang::ASTNodeImporter::ImportImplicitMethods(), isDefinedInClangModule(), clang::TagTypeLoc::isDefinition(), isImportedDeclContext(), IsIncompleteClassType(), clang::Type::isIncompleteType(), clang::Sema::IsValueInFlagEnum(), LookupDirect(), MethodsAndNestedClassesComplete(), TypeIsInnerPointer(), UseNSOptionsMacro(), clang::ASTNodeImporter::VisitClassTemplateSpecializationDecl(), clang::ASTDeclWriter::VisitCXXRecordDecl(), clang::TextNodeDumper::VisitCXXRecordDecl(), clang::ASTDeclReader::VisitCXXRecordDeclImpl(), clang::ASTDeclReader::VisitEnumDecl(), clang::TextNodeDumper::VisitRecordDecl(), and clang::ASTDeclWriter::VisitTagDecl(). Return true if this complete decl is required to be complete for some existing use. Definition at line 3177 of file Decl.h. Referenced by shouldOmitDefinition(), and clang::ASTDeclWriter::VisitTagDecl(). Whether this declaration declares a type that is dependent, i.e., a type that somehow depends on template parameters. Definition at line 3219 of file Decl.h. Referenced by clang::ASTRecordWriter::AddCXXDefinitionData(), canPassInRegisters(), clang::Sema::CheckCompletedCXXClass(), clang::Sema::CheckOverridingFunctionExceptionSpec(), clang::Sema::SetDeclDefaulted(), clang::Sema::ShouldDeleteSpecialMember(), and clang::CodeGen::CodeGenTypes::UpdateCompletedType(). True if this tag declaration is "embedded" (i.e., defined or declared for the very first time) in the syntax of a declarator. Definition at line 3192 of file Decl.h. Definition at line 3252 of file Decl.h. True if this tag is free standing, e.g. "struct foo;". Definition at line 3203 of file Decl.h. Definition at line 3249 of file Decl.h. Referenced by getTagForRecord(), clang::CXXRecordDecl::isInterfaceLike(), and clang::Type::isStructureOrClassType(). Definition at line 3248 of file Decl.h. Referenced by getAccessFlag(), getTagForRecord(), clang::CXXRecordDecl::isInterfaceLike(), clang::Type::isStructureOrClassType(), and isValidBaseType(). Return true if this declaration is a completion definition of the type. Definition at line 3163 of file Decl.h. Referenced by clang::index::IndexingContext::indexTagDecl(), clang::Sema::setTagNameForLinkagePurposes(), clang::ASTNodeImporter::VisitClassTemplateSpecializationDecl(), and clang::ASTDeclWriter::VisitCXXRecordDecl(). Definition at line 3251 of file Decl.h. Referenced by clang::CodeGen::swiftcall::SwiftAggLowering::addTypedData(), BuildImplicitMemberInitializer(), clang::Sema::CheckBaseSpecifier(), CheckConstexprCtorInitializer(), clang::Sema::CheckConstexprFunctionBody(), defaultedSpecialMemberIsConstexpr(), DiagnoseBadFunctionCast(), DiagnoseBaseOrMemInitializerOrder(), diagnoseUnreadableFields(), clang::CodeGen::CodeGenFunction::EmitAggregateCopy(), clang::CodeGen::CodeGenFunction::EmitLValueForField(), EmitNullConstant(), clang::CodeGen::CodeGenFunction::EnterDtorCleanups(), EvaluateBinaryTypeTrait(), EvaluateComparisonBinaryOperator(), FieldHasTrivialDestructorBody(), getAccessFlag(), GetGCAttrTypeForType(), getTagForRecord(), getTypeExpansion(), HandleClassZeroInitialization(), HandleConstructorCall(), clang::ASTContext::hasUniqueObjectRepresentations(), clang::Expr::isConstantInitializer(), isDesignatorAtObjectEnd(), clang::CodeGen::ABIInfo::isHomogeneousAggregate(), isLayoutCompatible(), isMemcpyEquivalentSpecialMember(), isReadByLvalueToRvalueConversion(), isSimpleZero(), IsTailPaddedMemberArray(), clang::CXXRecordDecl::isTriviallyCopyable(), clang::Sema::MarkBaseAndMemberDestructorsReferenced(), and tryMatchRecordTypes(). Indicates whether it is possible for declarations of this kind to have an out-of-date definition. This option is only enabled when modules are enabled. Definition at line 3214 of file Decl.h. True if this decl is currently being defined. Definition at line 3120 of file Decl.h. Referenced by completeDefinition(), startDefinition(), and TagDecl(). Definition at line 3145 of file Decl.h. Referenced by clang::Sema::InstantiateClass(), and clang::ASTDeclReader::VisitTagDecl(). True if this decl has its body fully specified. Definition at line 3171 of file Decl.h. Referenced by completeDefinition(), clang::ExternalASTMerger::CompleteType(), TagDecl(), clang::ASTDeclReader::VisitEnumDecl(), clang::ASTDeclReader::VisitTagDecl(), and clang::ASTDeclReader::VisitUnresolvedUsingTypenameDecl(). True if this complete decl is required to be complete for some existing use. Definition at line 3183 of file Decl.h. Referenced by TagDecl(), and clang::ASTDeclReader::VisitTagDecl(). Definition at line 3198 of file Decl.h. Referenced by GetDeclSpecTypeForDeclarator(), TagDecl(), and clang::ASTDeclReader::VisitTagDecl(). Definition at line 3206 of file Decl.h. Definition at line 3126 of file Decl.h. Referenced by clang::RecordDecl::Create(), clang::EnumDecl::CreateDeserialized(), and clang::RecordDecl::CreateDeserialized(). Definition at line 3946 of file Decl.cpp. References clang::ASTContext::Deallocate(), clang::Decl::getASTContext(), and clang::QualifierInfo::QualifierLoc. Referenced by clang::TemplateDeclInstantiator::InstantiateEnumDefinition(), and clang::ASTNodeImporter::VisitClassTemplateSpecializationDecl(). Definition at line 3246 of file Decl.h. Referenced by clang::Sema::InstantiateClass(), TagDecl(), and clang::ASTDeclReader::VisitTagDecl(). Definition at line 3966 of file Decl.cpp. Definition at line 3891 of file Decl.cpp. References clang::TypeDecl::getTypeForDecl(), clang::NamedDecl::isLinkageValid(), and clang::Type::isLinkageValid(). Referenced by clang::TemplateDeclInstantiator::InstantiateTypedefNameDecl(), and setTypedefNameForAnonDecl(). Starts the definition of this tag declaration. This method should be invoked at the beginning of the definition of this tag declaration. It will set the tag type into a state where it is in the process of being defined. Definition at line 3900 of file Decl.cpp. References clang::Decl::getASTContext(), clang::Redeclarable< TagDecl >::redecls(), and setBeingDefined(). Referenced by clang::CodeGen::CGOpenMPRuntime::CGOpenMPRuntime(), clang::CodeGen::CGOpenMPRuntimeNVPTX::clear(), createKmpTaskTRecordDecl(), createKmpTaskTWithPrivatesRecordDecl(), createPrivatesRecordDecl(), clang::CodeGen::emitDeclareSimdFunction(), emitReduceFiniFunction(), clang::CodeGen::emitTaskInit(), clang::ASTContext::getBlockDescriptorExtendedType(), clang::ASTContext::getBlockDescriptorType(), clang::CodeGen::CodeGenModule::getObjCFastEnumerationStateType(), clang::CodeGen::getTgtBinaryDescriptorQTy(), clang::CodeGen::getTgtDeviceImageQTy(), clang::CodeGen::getTgtOffloadEntryQTy(), clang::ASTNodeImporter::ImportDefinition(), clang::Sema::InstantiateClass(), and clang::TemplateDeclInstantiator::InstantiateEnumDefinition(). Definition at line 3131 of file Decl.h. Definition at line 3132 of file Decl.h.